Yeah this series was awful. I'm not going to dwell on it other than to tell you this: It's not discouraging to me at all, other than the bullpen. We gave two games away in the pen. I honestly believed it would be a problem at the beginning of the year, and I also honestly believe it will start to get better. So let's move on to the recaps. Game 1 Braves were up 2-1, looking good, and then Bryce Harper hammered a 2-run homer off Stults in the 6th inning, and the game was basically over. The bullpen then gave up another 6 runs to the Nats but that was just piling on. When Stults gave up the lead, the game was in hand for the Nats. The Braves looked defeated and lost. Braves lost 9-2. Game 2 Braves were down 6-1 and again looked lost. But this time they crawled back in the later innings to tie the game at 6-6. However, the bullpen struck again. 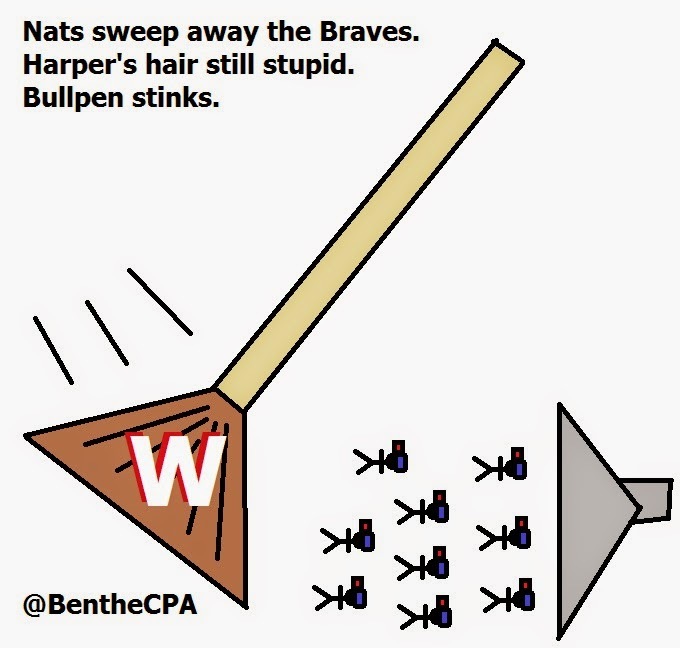 Bryce Harper ripped a game winning 2-run homer in the bottom of the 9th to win the game for the Nationals 8-6. You sensing a theme here? It's called "Bryce Harper makes you cry." Also Julio was the bad Julio in this one, and we don't want to see that again. 10 hits, 6 earned run, and 2 homers. It wasn't good. He needs to get his act together because even though the Braves were in this one, six runs for the good guys should be an easy win. You know how much run support Julio has gotten? 41 runs in 7 games. He's almost averaging 6 runs a game. And you know how many of those the Braves have won? A 4-3 record. That's pathetic. Braves lost 8-6. Game 3 Braves were down 3-0 early thanks to Alex Wood not getting the third out in the first inning for a long while, then they rallied back to take the lead 4-3. That came on several hits by Alex Wood himself who went 3/3 hitting the ball and got an RBI. He battled so I can't hold it against him. But what happened? Fredi Gonzalez put the same bullpen guy, Cody Martin, back on the mound again after he gave up the losing homer to Harper the night before. And what happened? Cody Martin gave the game away. At some point you have to realize as a manager that a guy struggles against certain teams. Cody Martin has done very well against everyone else EXCEPT Washington. In fact, if you look at his games that aren't against the Nats, he's gone almost 15 innings giving up 2 runs. Against Washington? He's gone 3 innings giving up 6 runs. Just stop using him against the Nats. PROBLEM SOLVED! Braves lost 5-4. The Bullpen - Do I even need to say why? Reference above. Julio's backslide - He looked great in his start before this. Now? Same crap, different day. Bryce Harper - I hate his hair, his attitude, and the fact he's really talented for the wrong team. The NBI (Needs Big Improvement) Award goes to Roger McDowell. When everything in the bullpen is going wrong, and most of the starters are going wrong, I need my pitching coach to get things together. He needs to right this ship and steer it towards the sunrise. Because if we can't do that, this season is going to be completely over by July 4th, and that's a bad bad feeling for everyone. Makes the fireworks a total downer I tells ya. Next up, Braves take on the Reds. I think we can beat the Reds, simply because they aren't that good. But we didn't beat them last time we played them at home, because right now our pitching isn't that good. So keep scoring offense! Six runs isn't enough!